Oh poor Rachel! I searched in vain last night but no picture must exist of our time at Uber Gatlinburg. I found pictures from that trip and you did have fun horseback riding and playing putt-putt. Erica must not have made it onto the Velcro wall either but it must not have traumatized her. The tubing in the river and down the tobaggon runs were a riot. I had fun looking at the pictures of our trips together. Maybe we can have a pinata at the wedding for you! pic 1 - I remember that picture in your bible! It was funny. pic 2 - I remember seeing you do that! I kept looking back and forth from the location to the picture going, "That was in Tennesse? It looks so familiar!" till I read the rest of the note. Halloween pic - great jackets! Our childhoods were so much more colorful (hyper-color, neon colors, 'hot' and 'electric' colors) that kids these days! And so many outfits used SO MANY of these colors in combination. It was awesome. UM. One. 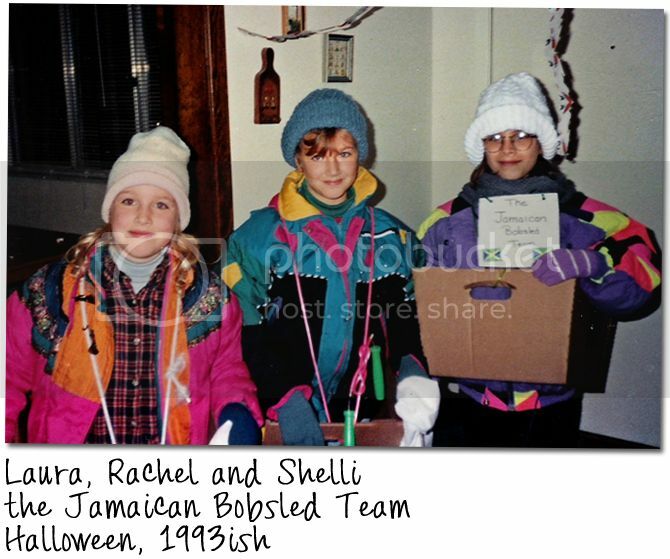 How in all the times we have talked about the infamous Cool Runnings incident in my life have you NOT mentioned your awesome Halloween costumes? Two. 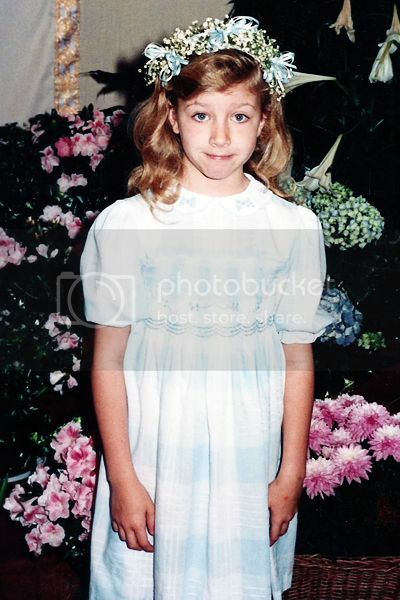 I remember the first Communion dress picture. It may be my favorite ever. hilarious. i mean, who gets a convertable for their first car? Jami, My first two cars were white convertibles--my next car was a mini-van. I think it evened out. VL, I like to keep some things mysterious. Al, I wish I still had that coat. Sheri, I would love a pinata AND a fly wall. Thanks!